Retrieve competitive quotes today via MoneyMaxim. We compare several insurers to cater for your Fishing insurance requirements. 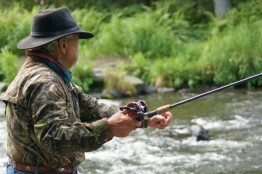 Fishing is a popular leisure activity worldwide and millions take part in it every day. Whether it is a trip to your local lake, or a holiday abroad on the sea, insurance to cover you, your equipment and others around you is vital to protect you against those unforeseen circumstances. From losing your rod or equipment in the river, catching yourself with the hook or damaging your equipment whilst in transit, these can all be covered with insurance found here with MoneyMaxim. There are various types of fishing around the world, whether it's angling, netting, fly or deep sea, your expensive equipment is at risk of loss, damage or theft in most scenarios. We feature companies that have several different levels of fishing cover for your equipment and travel requirements, depending on what your specific needs are. Policy features for equipment cover include new for old replacement if stolen, lost or damaged, whether 1, 2, 3 or even up to 4 years old. If items are over this age, you will find most of the insurers will either replace this to the equivalent at the time of damage, or repair the item. You will find the companies featured also offer cover for when overseas, with extras including cover for either Europe or Worldwide for 30, 60 or 90 days a year (subject to policy T&C's). The level of cover for when abroad will vary between insurer and also within the certain policy that the insurer offers. Two of the companies featured on this page Choose Your Insurance and The Insurance Emporium you will find have policies that are mainly designed to cover your equipment whilst in use whether in the UK or whilst abroad. If however you're on a fishing holiday and need the suitable travel insurance, you will find JS Insurance could offer the travel cover for you, but also equipment cover whilst in transit or storage. Do bear in mind this policy would not cover the equipment whilst in use, so you may wish to retrieve quotes from all insurers to cover you for most scenarios. Some areas of the cover included within the Fishing Insurance policies featured here on MoneyMaxim do have an excess payable when making a claim, so as ever like with all insurance policies it is important you check through your policy documents around inclusions and exclusions and as to whether this applies to you. If the Fishing travel insurance featured here on this page does not suit your specific requirements or offer suitable cover for you, you can always try our panel of Travel Insurers here, who could assist further. Any Queries? Call us! Unlike other comparison sites we have people to help on hand! Just call us on 0800 520 0699 option 3. We'll be happy to help.